My name is Heidi Bristow and I Walk to End Alzheimer’s in Memory of my dad, Ellsworth German, and my grandfather, Christian German. Unfortunately Alzheimer’s has taken its toll on my family since 1983 about the time that Alzheimer’s awareness began to finally take shape in our country. My Grandfather was diagnosed in late 1983 with this disease along with ALS…yes double trouble. With these two serious diseases working against him his life was cut short in August of 1984. Watching this decline in my grandfather in my late teenage years was very traumatic especially when he was unable to recognize me. Being an only grandchild, he spoiled me rotten and he was truly my hero. Loosing him even before his death hurt deeply and I had hoped to never face that disease again. Years later in 2009 about 10 years after my mother had passed away from heart disease I noticed some very disturbing symptoms begin to appear in my father that were all to familiar to some seen in my grandfather. Not something anyone wants to hear but being an only child the news was even more devastating. Finally after much persuading I talked my dad into seeing a neurologist and yes the diagnosis was as suspected…early stages of Alzheimer’s. My heart sunk into my chest…oh no not again. Luckily my dad was still able to live at home, travel and be very self-sufficient much longer then I had thought. He was one good spirited and highly independent man that was not going to let this disease get the best of him. However in 2014 we noticed other complications were beginning to appear in him that now indicated he also had Parkinson’s disease. Yes…double trouble once more. From that time on my dad experienced a much more rapid decline in his health both physically and mentally. At this point I knew that it would not be long before my dad would require 24/7 skilled care so my search for the best facility possible in our area began. By April of 2015 we knew the time was close to when dad would need to move from his home into a long term care facility. I had selected Heron Cove a Riverside Facility in Gloucester, VA. But how do I tell him this? He will be heart broken and as usual angry with me. As most caregivers know they like to lash out at the ones closest to them. This was probably the hardest part for me in dad’s decline until of course he no longer recognized me, my husband or his wonderful grandsons (in their early 20’s). His decline was very hard on the boys but the importance of visiting with him no matter how hard it was could not be stressed enough. Late in May my dad’s ability to eat solid foods was greatly effected by the Parkinson’s disease complicated by Alzheimer’s and this required a hospital admission. Definitely not what I would have planned but it proved to be a blessing in disguise. Mainly because the news that he was no longer able to go home came from his doctor not from me. Praise the Lord!!!! Luckily I had made some preliminary arrangements with Heron Cove and dad’s transition from the hospital to there went extremely well. I cannot stress enough to families dealing with this illness to pre-plan for long term care. You never know when something sudden like my dad’s hospital admission could be a game changer and you are left to settle for some place you may not want versus already having planned ahead and selected a place for them. My pre-planning although very difficult at the time had truly paid off. The first 3 weeks dad was at Heron Cove he was pretty stable and was able to be taken around the facility and out in the garden by wheelchair and enjoy meals in the dining room with the other residents. Having a very strict soft food diet he was not very pleased however he never turned down this bowl of vanilla ice cream at each meal, even breakfast. I loved to tease him that I wanted to be on his ice cream diet, which sounded good to me. Those 3 weeks were filled with visits from many friends and family members, even our little dog Buster came to visit a time or two. On my daily visits we reminisced about earlier times, listened to music and looked over old photo albums, anything to make him smile was my goal. However much to my surprise on June 30th I received a call from his nurse that turned my world upside down. I was told to gather our family and come to Heron Cove. She felt my dad’s time was short and she wanted me and my family to have as much time with him as possible. This was just such a shock for me…I knew he was worse but to loose him already was so unexpected. We all gathered that evening and spent quality time with him and he responded to each of us even by name…yes by name. The following morning I was called to Heron Cove bright and early to find that dad was now bed ridden and very unresponsive. The end was near and my heart was breaking. I kept vigil by his bedside with other family and friends until he went to his heavenly home on July 2, 2015. It was a peaceful passing and I know dad has been made new again. So that is why I walk….in the memory of my grandfather and now my dad. We MUST fight to find a cure for this horrible disease that is taking so many of our loved ones. I worry about myself and my children with this disease being so prominent in our family. It’s not too late for us…WE MUST FIND A CURE, and that is why I walk and I know he will be walking beside me every step of the way. 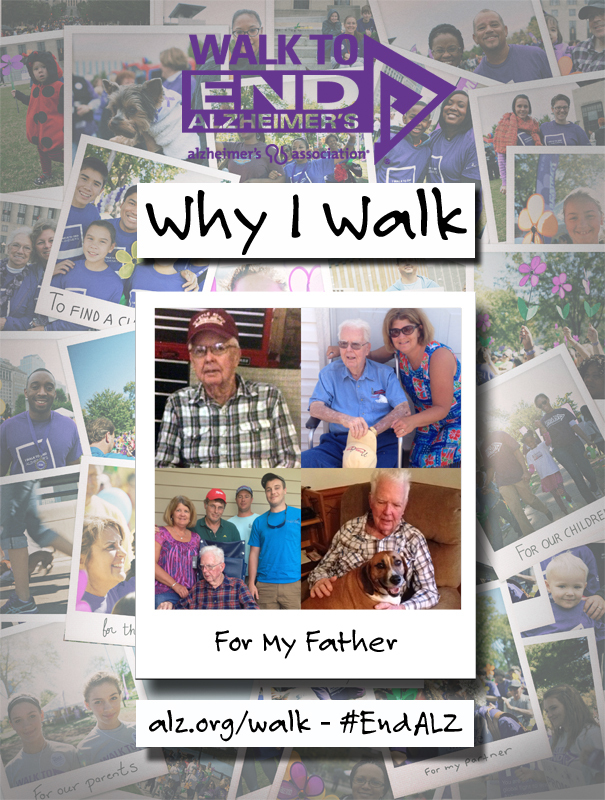 Register for the 2015 Walks to End Alzheimer’s! This entry was posted in Why I Walk and tagged Alzheimer's, Caregiver, Central Virginia, Dementia, Walk, Walk to End Alzheimer's. Bookmark the permalink. I was asked to write a blog for the Greater Richmond Alzheimer’s Chapter about my dad. It was published today…wanted to share it with you!